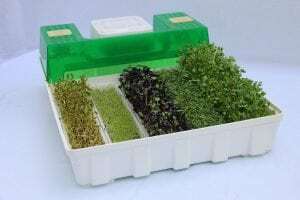 The EasyGreen “Light” Sprouter (EGL 50) is one of the most convenient devices for growing sprouts, micro-greens, wheatgrass, grasses for juicing, and many other seedlings. The automatic water mister, sprouting enclosure, and drainage system help ensure a healthy, consistent, yet flexible, growing environment. Patented Mist Generator technology simultaneously distributes mist and oxygen to seeds and sprouts. Special timer allows 15 minute misting cycles up to 48 times per day accommodating meteorological conditions and varying seed requirements. Lid has handle for easy access to growing compartment. 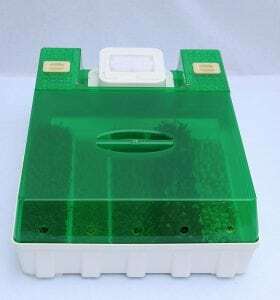 Click here to check out the new float valve automatic watering system and you’ll never have to add water to your Easygreen again.